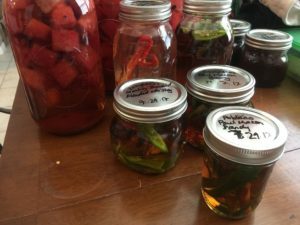 Two summers ago, I took a cordial-making class at my very first Pennsic. It was great — admittedly, at the time, it was basically an excuse to drink someone else’s booze. I barely knew what a cordial was but took a friend and was pleasantly surprised. The class itself was actually really interesting and I ended up way more engaged in it than I had expected to be. I have to admit, I liked the idea of a project that was, essentially, set-and-forget. Cordials are easy to make; they just take a long time for results, so you need patience. I made some cordials with pears from my family’s ranch last year. I aged them five months (primarily by putting them in a closet and forgetting about them) and took them with me to Gulf Wars to pour for people. They were a pretty decent hit at Gulf Wars. The pears did not add much flavor themselves, but the spices I put in with them were a big hit. 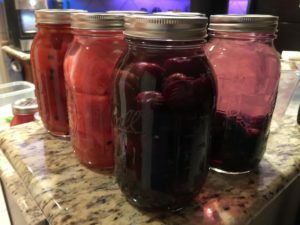 I finally started making cordials this year in a more serious way, now that I’m back in a real city and have access to alcohol at bulk rates (thank you, Ye Olde Costco). My family’s garden is yielding some amazing fruits and veggies, too, so I have been putting those to good use. I’m using either vodka or brandy for most of my cordials. Brandy is generally the alcohol of choice for in-period recipes, but vodka is also quite popular as a vessel for flavor since it has no real flavor of its own. 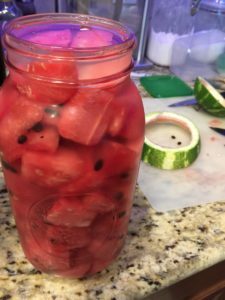 Watermelon, cubed and in the jar. 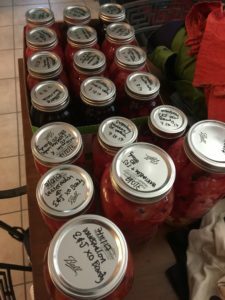 Doing the cordials now means I can let them sit for months before A&S competitions or Inter-Kingdom Brewing Guild competitions. My hope is to bring most of these to either Gulf Wars 2018 or Pennsic 2018. 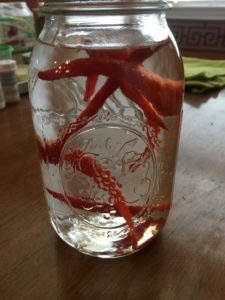 And since I reside in the stellar kingdom of Ansteorra, I decided to make a few… more dangerous cordials. These peppers all came from my family’s garden. 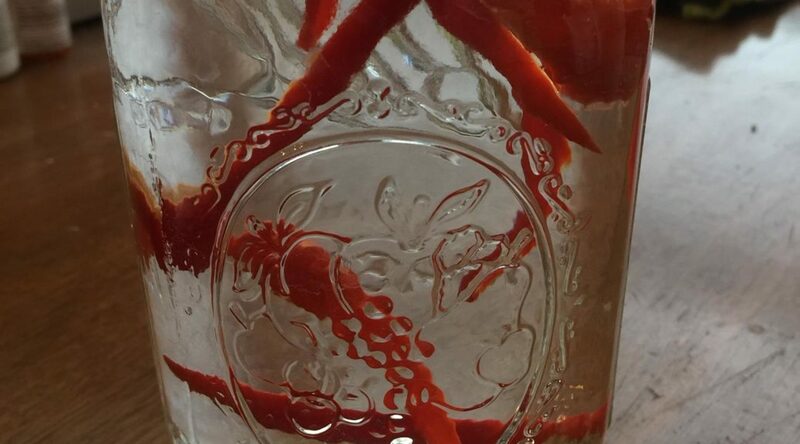 Unlike normal cordials that are allowed to stew for at least a month, if not more, peppers need to be strained about a week after being placed in the alcohol. I’ll be adding sugar water to these in a few days and start the next round of the aging process. It should be interesting. 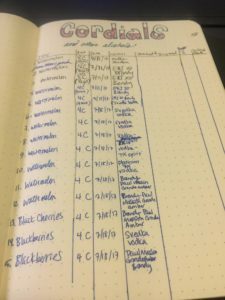 I keep track of the recipes in my SCA notebook. These all get transferred over to a spreadsheet, which is being stored in the cloud. At the moment, I currently have more than six gallons of cordials working. It’s a lot of booze, but I trust my SCA family can help me dispose of it. Fruit and Berry Cordials, hard at work.